► GUINEA: Zambia's Stabo Air starts 1x weekly Conakry, Dakar, Banjul cargo ops. Zambian cargo and passenger air charter service, Stabo Air, has launched a 1x weekly (Day 6) Boeing 757 operated cargo service between Dakar, Conakry and Banjul. ►► SOUTH AFRICA: Mega Maldives Airlines looks to start Johannesburg. [UPDATE 21 JANUARY] Following the recent arrival of a Boeing 757-200ER, Maldivian airline Mega Maldives Airlines (5M) has announced plans to expand its international network, with Johannesburg being amongst the destinations being considered, though no specific date has been mentioned. ►► GHANA: Ethiopian makes various operational changes to Accra, Abidjan, Cotonou, Lomé and Ouagadougou flights from late November. Effective 25 November 2012, Ethiopian Airlines (ET) will adjust its operations to Accra, Abidjan, Cotonou, Lomé and Ouagadougou service. Of particular interest is that Accra will receive a daily 787 service, replacing its current 757. ► ITALY: Ethiopian Airlines resumes Milan Malpensa via Rome-Fiumicino. Since 10 September, Ethiopian Airlines (ET) has resumed operating its daily Addis Ababa - Milan Malpensa flight via Rome, Fiumicino; a route it last operated up until 31 May of this year. Previously Milan was routed via Brussels with Rome being an intermediate stop on the Stockholm, Sweden flight. ► CONGO (BRAZZAVILLE): EC Air Congo to start Douala, Cotonou, Ollombo following last week's Paris service launch. As previously reported by The African Aviation Tribune, Congolese private carrier Equatorial Congo Airlines, better known as EC Air Congo (LC), last week Friday 24 August, inaugurated its first international route: a 3x weekly Brazzaville, Congo - Paris (Charles de Gaulle) service using a Boeing 757-200 leased from Switzerland's PrivatAir. ► RUSSIA: Ethiopian Airlines Cargo resumes services to Moscow after 22 year hiatus. After a 22 year hiatus, brought about by the collapse of the Soviet Union and along with it, the Derg Regime of Ethiopian strongman Mengistu Haile Mariam, Ethiopian Airlines Cargo, on 15 August, reintroduced a twice weekly direct Addis Ababa - Moscow, Domodedovo flight using a Boeing 757-200PCF. "For the first time in 22 years a direct flight will be performed from Ethiopia to Moscow. Ethiopian Airlines will operate its first cargo flight from Addis Abeba to the capital of Russia. It will be loaded with the beautiful and fragrant cargo – flowers, that are intended to be demonstrated during the “Week of Ethiopian Flowers” exhibition which will be held from 17th to 19th of August at All-Russia Exhibition Center. Starting from August 2012 Ethiopian Airlines will operate regular cargo flights to Domodedovo twice a week. The main cargo goods transported from Ethiopia to Russia include flowers, coffee, olives and beans, gold, leather and spices." In addition to the utilization of the belly space inside Ethiopian Airlines' passenger fleet - B787, B767-300, B757-200, B777-200 LR, B737-700 and B737-800 aircraft - Ethiopian cargo services operates dedicated freighter aircraft namely two Boeing 747-200F, two Boeing 757-200PCF, two McDonnell Douglas MD-11Fs with six Boeing 777F on order - on a charter and scheduled basis. 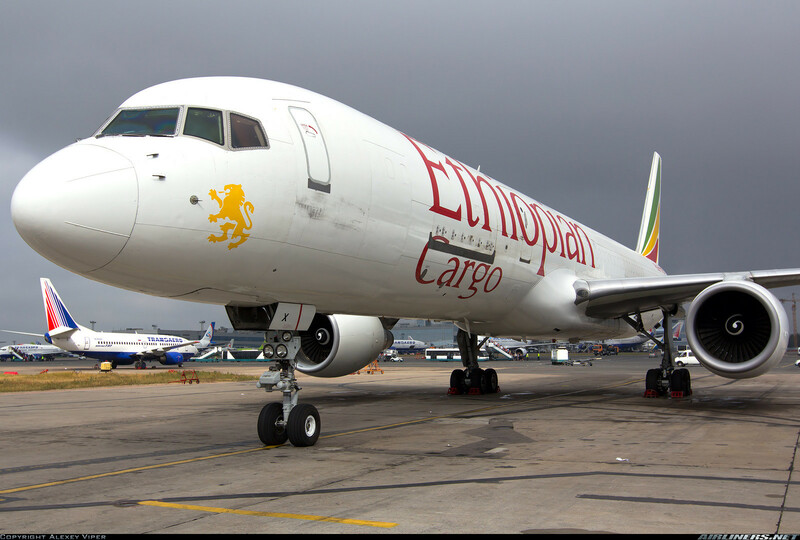 Currently Ethiopian operates over 40 cargo destinations spread across Africa, Europe, Asia and the Middle East via its hub – Addis Ababa, and another cargo hub at Liege in Belgium. ► CONGO (BRAZZAVILLE): EC Air to start Brazzaville - Paris. Republic of Congo airline Equatorial Congo Airlines (LC), or more commonly EC Air, are to start 3x weekly flights between Brazzaville and Paris Charles de Gaulle Airport, using its Boeing 757-200.